Get your knobbies on and meet us out in the forest to get some miles in! These rides will be 90% gravel logging roads, so minimum 33c tires are recommended, preferably with knobs. Cyclocross bikes work great for this type of riding, as do wider tire "Adventure" Road bikes. You can even bring your XC bike if you think you can keep up! These rides will be primarily 20-30 miles (With the option to do more if the group dictates. For the 2018-19 season we will be mixing up the starting locations on a weekly basis. Why you ask? 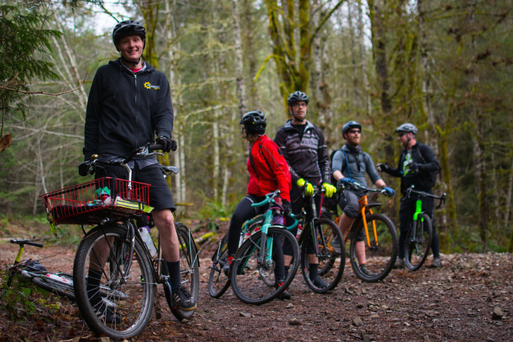 We feel like there are just too many great routes to explore and by starting down town westside we are limiting our potential to give you the best gravel experience possible. That said, we will still be returning to Skep and Skein for our post ride routine. Why should you come on these rides? Check out these pictures from one of last years rides and see for yourself! Every other Sunday! These rides are bi weekly, and start at 10am from the designated start area. Rides go from September through April. We recommend some sort of Cyclocross esque "Adventure bike" for these rides. Because of the length and elevation profiles the bike should be relatively light, under 30lbs and have tires that are 36-40c minimum. Light weight cross country bikes are also appropriate, as long as you are ready to pedal 20-25 miles on it. Wondering where we're talking about when we reference our start locations? Wonder no more!